Among the participants discussing recent trends in their respective fields and in areas of common interest in these proceedings are such world-famous geometers as H.S.M. Coxeter, L. Danzer, D.G. Larman and J.M. Wills, and equally famous graph-theorists B. Bollobás, P. Erdös and F. Harary. In addition to new results in both geometry and graph theory, this work includes articles involving both of these two fields, for instance Convexity, Graph Theory and Non-Negative Matrices'',Weakly Saturated Graphs are Rigid'', and many more. 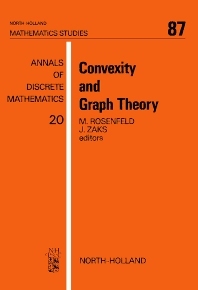 The volume covers a broad spectrum of topics in graph theory, geometry, convexity, and combinatorics. The book closes with a number of abstracts and a collection of open problems raised during the conference.